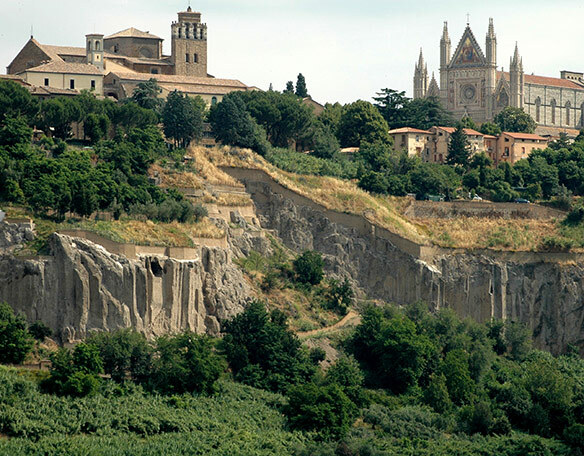 The town of Orvieto has an immense cultural and artistic heritage in Umbria. The Duomo is one of the masterpieces of the Italian medieval art, a remarkable piece of art of Lorenzo Maitani, during the 13thcentury. The gothic façade , decorated with mosaics and carvings, shows a rose window art work of Orcagna. Inside, among many works of art preserved, there’s a masterpiece of the 15th century Italian art: San Brizio chapel offering works of Beato Angelico and Luca Signorelli. 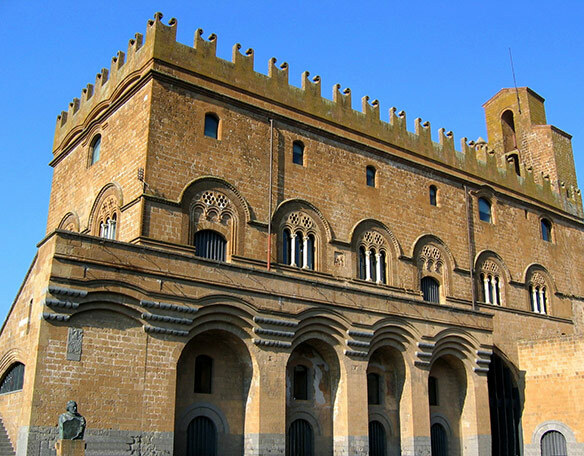 Among the oldest religious buildings: Saint Giovenale church, built in the 1004 and enlarged in the 15th century, shows frescoes of the Orvieto school ; Saint Giovanni church, built in the 916 on the top of the Costantino theatre, façade of 500 ;Saint Andrea church, it dates back to the 4th century, rebuilt in the 10th century and completed in the 300, Saint Domenico church (12th century) , housing the funeral monument at the Cardinal de Braye by the artist Arnolfo di Cambio. 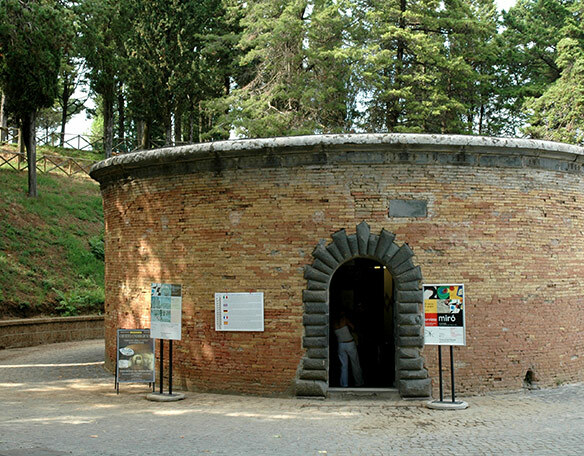 Unique is the visit of Saint Patrique’s well , a masterpiece of Antonio da Sangallo the Younger to bring water to the town. 62 metres deep, it’s made of two spiral ramps in a double helix that permitted to go downstairs for water without meanwhile meet with the one who goes upstairs. The Waterfalls, which are immersed in a natural scenery of incomparable beauty, are an artificial work due to the Romans. In fact, at that time, the Velino river was greatly enlarged and had created a vast zone of stagnant waters, swampy and unhealthy. Aiming to make these waters deflow, the consul Curius Dentatus had a canal dug which directed them in direction of the Marmore cliff. From there, he had them precipitate, in a total fall of 165 meters, into the river-bed of the Nera river which runs along below. In every age, the beauty of the Waterfalls has inspired poets and artists, among these: Virgilius, Cicero, G. Byron, and many others. For about 50 years now the waters of the Waterfall are used to fuel the hydroelectric power plant Galleto. Therefore, the spectacle of the Waterfalls can only be admired during the opening hours which are quoted in the table below. 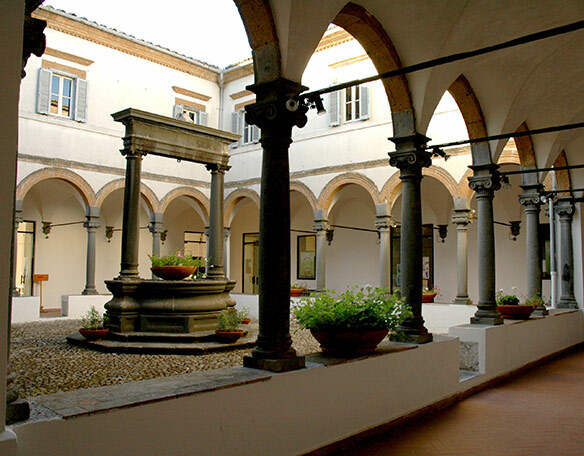 It was in fact due to the abbundance of these waters and the energy they generate that it was possible to establish the metal-working, electrochemical and electric industries at Terni. 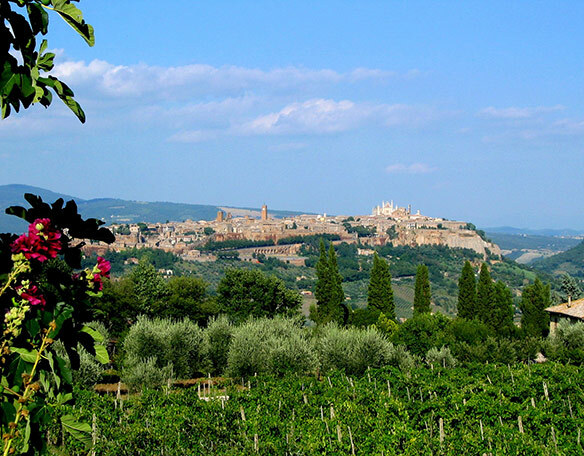 Spello rises up between Assisi and Foligno, situated on a spur of the Subasio Mountain above a fertile and well-irrigated plain. Among the neighbouring cities, this is surely the one which preserves the major number of monuments testifying to the Roman era; for example, the town walls, which later became the foundations for the medieval walls, the ruins of the theater and the amphitheater, the thermal baths and the splendid town portals Porta Consolare, Porta Urbica and Porta Venere dating back to the Augustean era. In ascent, you’ll arrive at the church of St. Mary Maggiore built Between the 11th and 12th centuries, which, even if it can boast a beautiful facade riconstructed with antique materials in 1644 at the same time as other architectonic modificatione were undertaken, guards its most precious treausure inside. Perugia, the great “Guelf strong-hold” rises up in the region’s heart, with its 5 storical quarters closed-in by its Etruscan town walls. These enormous bastions formed by cyclopic square masses, were constructed 22 centuries ago and are still visible for long stretches. When the city of Rome was little more that an encampment of huts, one could already enter the etruscan Perugia Italy using one of 7 portals, among which one was particularly mighty, the Porta Pulchra or of Augustus, dating back to Etruscan times. Entering the city via Porta San Pietro, whose exterior was remodelled by Agostino di Duccio in 1475, you’ll arrive at the basilica of St. Dominic on the right-hand side; the very important National Archeological Museum of Umbria is to be found in the adjacent cloisters and convent. The Lake Trasimeno has a surface area of 128 km² and this ranks it as Italy’s fourth largest lake. Its maximum depth is 6 mt. There are three lovely islands on the lake, two of which can be visited: Polvese Island with its park and groves, and Maggiore Island with its little fishing village, still inhabited, dating back to the 1400’s. Bolsena’s lake is the largest European volcanic lake. The two islands, Martana and Bisentina (the rests of two small volcanic cones), after having been abandoned for centuries, are now open to the public. 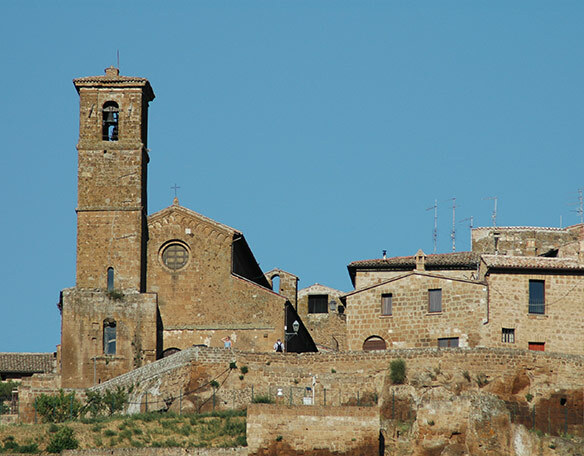 Bolsena is the Miracle’s city happened in 1263 in the basilica consecrated to the Saints George and Cristina. In 1264, has been instituted the “Corpus Domini” festivity.This festivity is celebrated with a procession and with the traditional “Infiorata” through the streets of Bolsena which are covered with floreal carpets. 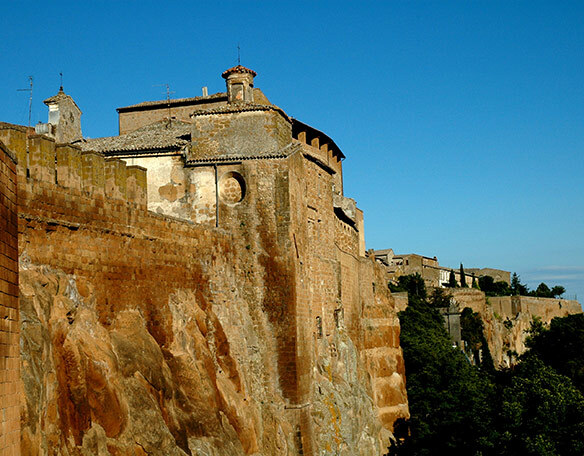 From Bagnoregio you can drive till Viterbo, capital of the province. To visit: the medieval quarter of San Pellegrino, the Sanctuary of Saint Rose, the Papal Palace, seat of the longest “Conclave” of the history of the Catholic Church. Pienza, a beautiful Renaissance town located in the Province of Siena in the heart of Tuscany, owes both its name and its fame to Enea Silvio Piccolomini, who rose to prominence as Pope Pius II. Renowned at the height of the mediaeval period under the name of Corsignano, it was a Sienese stronghold famously mentioned in a story by Giovanni Boccaccio. 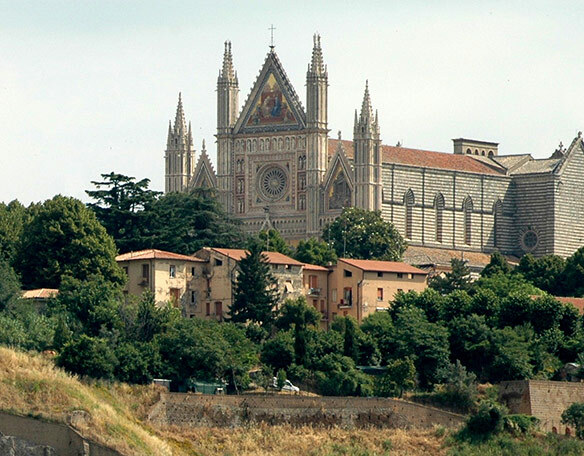 Much of its finest architecture was commissioned by Pius II between 1459 and 1462. He summoned one of the most famous architects of the time, Bernardo Rossellino, to come and work in Corsignano, so transforming his native town into a beautiful Renaissance centre, an extraordinary example of C15 architecture and urban planning. 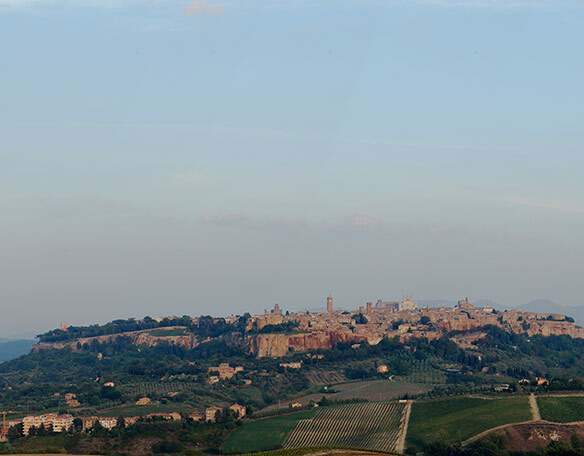 The home of Brunello, Italy’s finest and most famous wine, Montalcino is situated at an altitude of 567 metres. Perched on a rocky hilltop, the town and its powerful fourteenth century fortress dominate all the surrounding countryside. 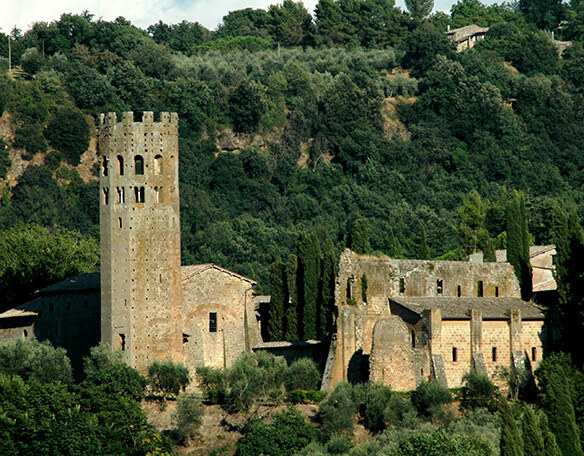 A short distance away, near Castelnuovo dell’Abate, in the valley of the Starcia, can be found the Romanesque Abbey of Sant’Antimo. Founded by Charles the Great in 781, this simple, evocative building has an almost magical atmosphere. 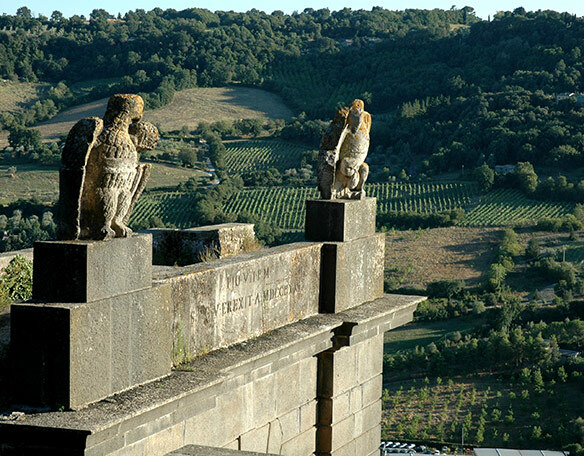 Montepulciano is built along a narrow limestone ridge, at a height above sea level of 605 meters. The village is surrounded by walls and fortifications designed by Antonio Sangallo the Elder in 1500 by order of Cosimo I. Montepulciano is known primarily for its imposing Renaissance palaces, the elegant beauty of its churches and the Vino Nobile, one of the most popular Tuscan wines at international level.Among the monuments: the Cathedral contains a beautiful triptych of Sienese painter Taddeo di Bartolo (1401), an altar by Andrea della Robbia and the memorial dedicated to Bartolomeo Aragazzi, carved by the famous architect and sculptor Michelozzo. Arezzo sits on a hill in oriental Tuscany. As witness, the architecture of the city itself takes pride in its very old origin which has seen it to be one of the most important etruscan cities, and subsequently, a strategic roman city. 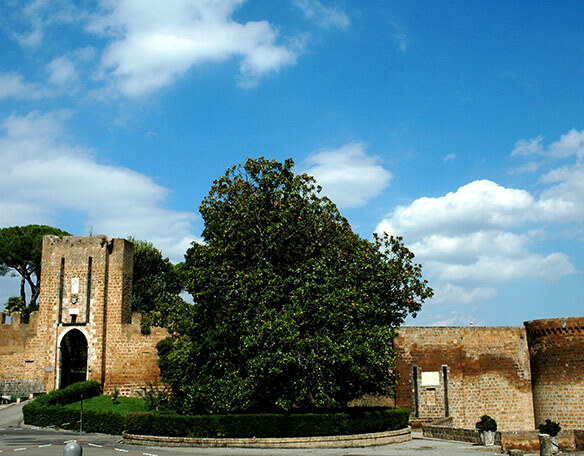 The highest part of the city retains a strong medieval aspect, dominated by the Cathedral and Fortezza Medicea. The Cathedral, which has gothic traits, houses valuable works of art, amongst which, La Maddelena di Piero della Francesca and the stained glass windows of Guillaume de Marcillat. At the centre of the city Piazza Grande is found, which unfolds a true anthology of styles; the penultimate Saturday of June and the first Sunday of September becomes the scene of the Giostra del Saracino, a jousting tournament of medieval origins. 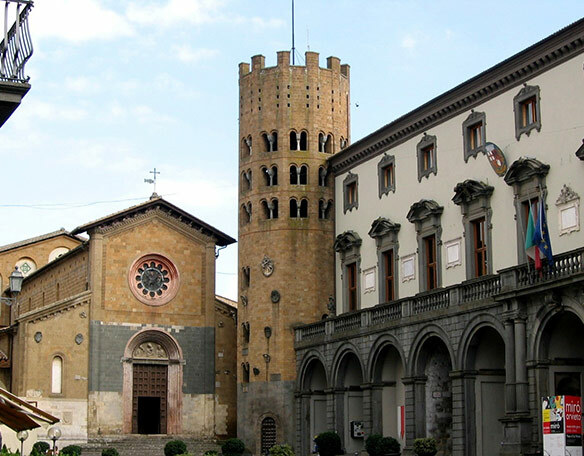 The same piazza, and a great part of the historical centre, every first Sunday of the month and the preceding Saturday holds the Fiera Antiquaria, antique fair.